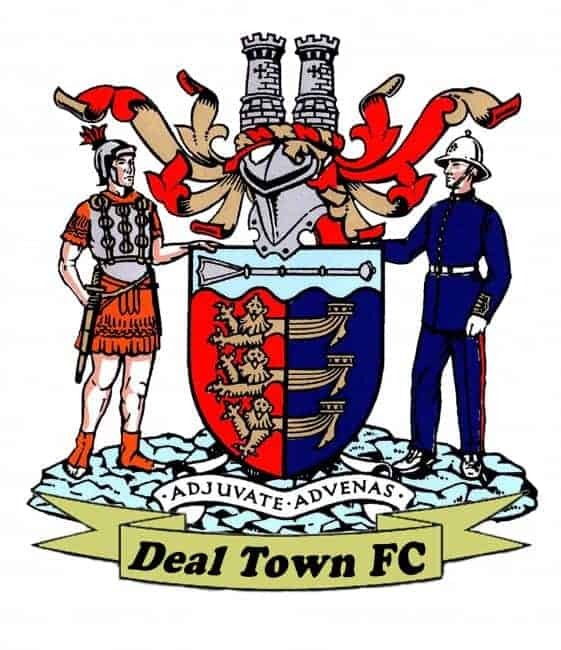 Deal now have a clear relegation battle on their hands after losing Saturday’s crucial clash with fellow strugglers Erith Town at the Charles Ground. Poor defensive play, with goalkeeper James Tonkin having to shoulder a fair slice of the blame, saw the Hoops slip to another defeat which leaves them just one place above the Premier Division “drop zone”. Missing two of their most battle-hardened defenders, skipper Dean Hill and Grant Bagley, who were both unavailable, Deal handed the Dockers only their second win in 10 matches and manager Derek Hares admitted afterwards: “It was definitely a game we needed to get something out of but again mistakes have cost us. We did well to come back from 2-0 down to 2-2 and are scoring enough goals to win games, but we are giving too many away. In a game where the stakes were high for both sides the tackles were soon flying in and local referee Stuart Marriott had to deal with a mass centre circle flare-up after only 13 minutes following a late challenge by Erith’s Ola Giwa on Luke Bigginton. After restoring order Marriott showed yellow cards to Giwa and team-mate Nathan Palmer, but seven minutes later Palmer made a more positive impact. The Hoops failed to deal with his inswinging corner and Erith defender Luqman Adesina headed the visitors in front from close range. It gave Erith just the encouragement they needed and with the Hoops reproducing little of their recent attacking zest, the Dockers reached half-time with their slender lead comfortably intact. Hares and assistant Steve King decided that changes were needed immediately and so they sent on Kristin Gregory in place of Andy Miller with Charlie Walsh pushed upfront. But it all looked in vain when, with 62 minutes gone, Tonkin came to the edge of his area to claim a high ball only to then spill it at the feet of Erith striker Jack Mahon who gratefully shot into the unguarded net. That moment could have knocked all of the stuffing out of the Hoops but instead they reacted in commendable fashion and, after Connor Coyne had twice gone close, Deal rocked the Dockers with a rapid two-goal burst. Firstly Ryan Philpott, returning to the side after missing the last four games through injury, was tripped in the area by Dockers’ right-back Jack Clark and converted the 75th-minute penalty himself. Then, with Erith finally beginning to show why they have the league’s worst defensive record, the Hoops were back on level terms three minutes later when Jack Paxman’s sublime far-post lob finished off a swift Deal counter-attack. But the Hoops’ hopes of pulling off an improbable comeback victory were dashed when they conceded two more sloppy goals in the closing six minutes. Mahon forced home his second following an 84th-minute goalmouth scramble and then Giwa drove the ball home under Tonkin’s diving body to complete the Deal keeper’s unhappy day. Deal: Tonkin, Hark, O’Brien, Bigginton, Scott, Walsh, Reeves, Paxman, Coyne, Adams, Miller (Gregory 45).